The heavy snow is starting to taper off. 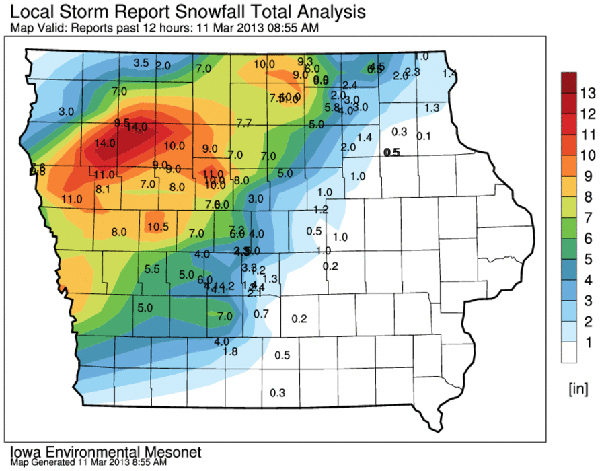 Several areas of western Iowa report snowfall totals from this storm between 8 and 11 inches, though Buena Vista County reports 14 inches of snow. Meteorologist Jim Lee, at the National Weather Service, says the heavy snow is beginning to ease. Lee says the snow will be ending by noon in central Iowa, but lingering into the afternoon in eastern Iowa. After several closures yesterday due to multiple crashes, Interstates 29 and 80 are open in both directions, but many other roads in western Iowa are impassible. Call 511 or visit 511ia.org for details.